English historian and Christian humanist Christopher Dawson stood at the very center of the Catholic literary and intellectual revival in the four decades preceding Vatican II. 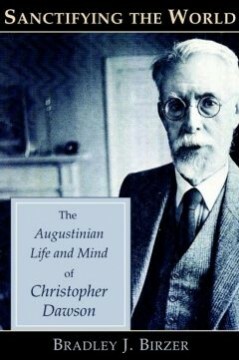 One can find his influence throughout the twentieth-century Catholic Right, and T. S. Eliot considered Christopher Dawson the foremost thinker of his generation. This book offers the first study of Dawson’s life and thought as a whole. It is especially poignant as a post–9/11 reexamination of the meaning of Western civilization. Sanctifying the World was named by biographer Joseph Pearce as the best book of 2008, and the National Catholic Register named it one of the top eleven books of the year. Bradley J. Birzer holds the Russell Amos Kirk Chair in History at Hillsdale College and is the author of J. R. R. Tolkien’s Sanctifying Myth.